The detail information to be shown by click the ticket kind button. Tickets to be required for Saturday and Sunday respectively. Free admission for children below elementary school age, which is required to be accompanied by family members and watch sitting on lap. Please purchase reserved tickets if you require to have seats for children below elementary school age. For the admission, special seat tickets, reserved tickets or admission tickets to be required. Stand seats are all reserved seats. No seats available for standing area. Same day tickets will end as the advance tickets are sold out. Please purchase tickets at same time if you wish to sit close each other. There is no any parking space inside of the venue. Please the toll parking lot near the venue. In case of rains for both days, it will process as plans. Please refrain from putting up in wet weather. We provide wheel chair users with dedicated space. Attendants up to 3 people can watch in the back of the dedicate seats with 4800yen for advance tickets and 5300yen for same day ticket. 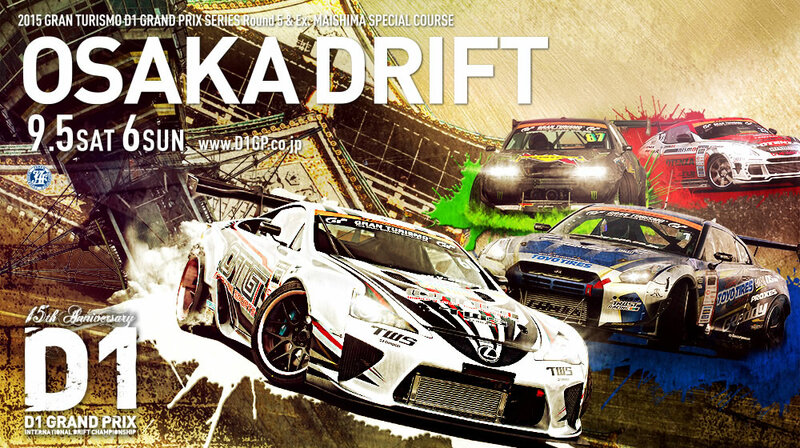 As it is limited 18 people for each day, please request to D1GP office at your earliest convenience. ※ PDF is open by clicking. ※ The course is subject to change. We offer the initial ticket purchase for the mobile website member ! We offer a special value for those who wish to purchase reserved tickets by 10 people or more. If you tell “ I want to watch OSAKA DRIFT with 10 or more people” and your desire date as well as number of people when you call, your ticket charge will be free. Ticket issue is processed normally like you can receive your ticket at Loppi at LAWSON or MINISTOP. You can not miss such a great opportunity. Passenger ride only for limited 15 people on each of dates !!! Premium seats are set up at the front row of B stand and offers more comfortable space with a 57cm width seat. As it is really close to the commentary seats, it is the best position to watch the race too! Also, this tickets offer a passenger ride experience and other extra benefits! As the tickets are limited in 15, please do not miss the chance of your purchase. ※ The photo image differs somewhat from reality. Good value seats only for limited 5 people !! The box seat setting up in A stand (180cm x 180 cm) holds 5 people. It is available to watch for 3600yen per box seat. Therefore, if more than 4 people, you can get better value than purchasing A stand seats individually. Also, it is perfect for a family. In terms of the race, you can watch the highest speed and drives at the most important scoring sector. It is the best position close to the commentary seats !! This SS seats will set up in B and C stands where is the closest view from a judge and feel a real sense of scale!! Also you can watch the TV screen just in front. For sure, a big satisfaction and value will be delivered to any person such as first visitors or core people. Please do not miss the chance of your purchase as it is expected to be sold out quickly ! Watching in the most comfortable space with wider seats !! 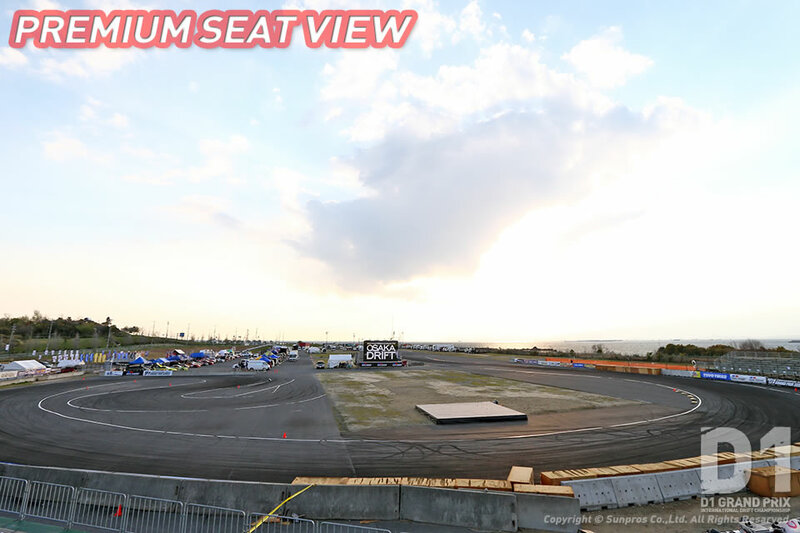 This setting up lower position row in D stand closer to C stand offers a 57 cm width seat where makes it possible to see the closest view in front of the commentary seats as well as skillful drives scene just in front of your eyes. 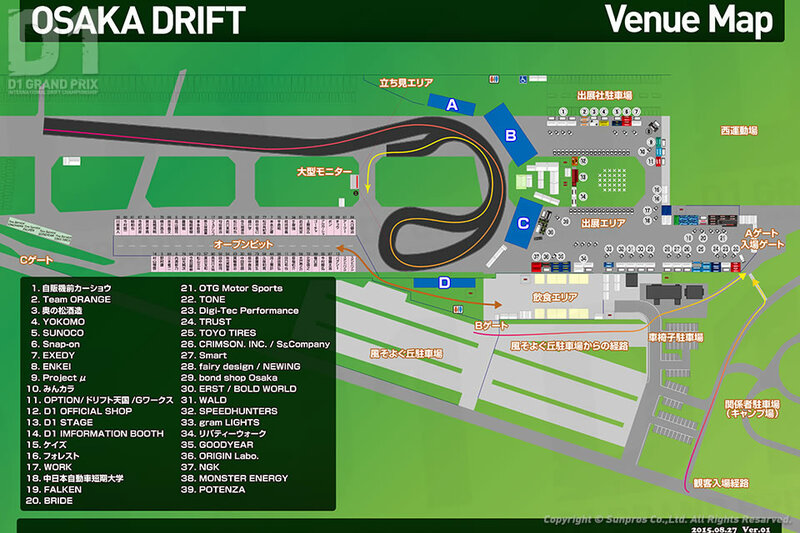 Also it is located near the pit area, you can watch how the teams are working there. Dedicated space for wheel chairs at the front row of A stand. We provide wheel chair users with dedicated space. Attendants up to 3 people can watch in the back of the dedicate seats with 4,800yen for advance tickets and 5,300yen for same day ticket. 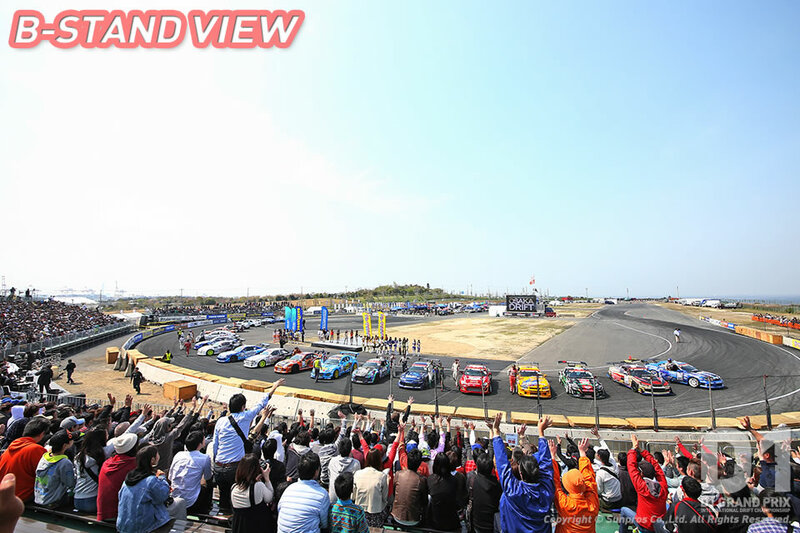 As it is limited 18 people for each day, please request to D1GP office at your earliest convenience. Good value tickets plus dynamic view ! You can have a close view right after starting to Furidashi and hear speeding up sound of D1 tuning machine ! 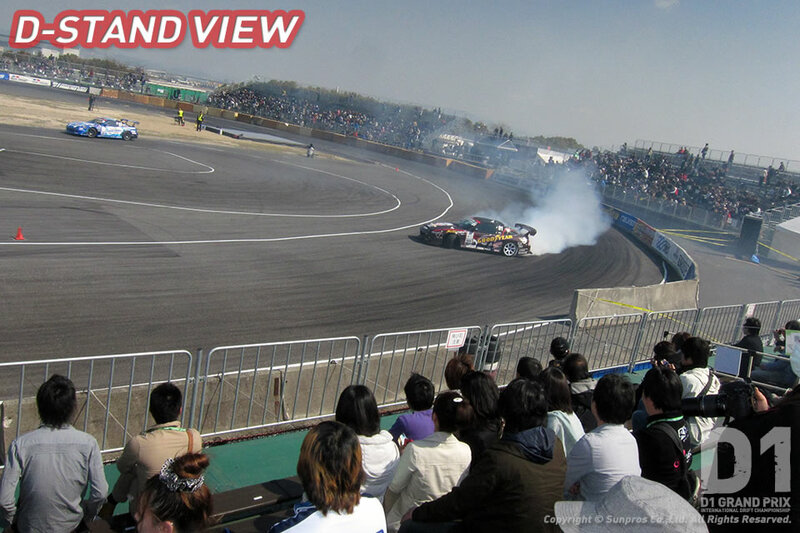 This is the exclusive view spot possible to watch the highest Furidashi of all of sector just in front of you !! Offering a good price for a solo watcher or couple. Upper or lower row selectable ! B stand is the very popular spot as you will be impressed with the powerful jumping into performance. 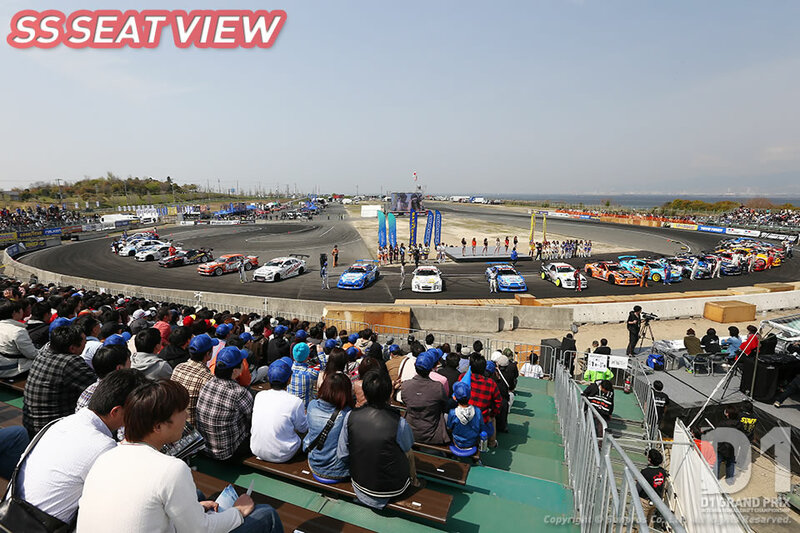 It will be the first time to give you a chance to choose lower row where you can enjoy the dynamic drive or upper row you can see a whole view. Also it is not as good as SS seats but you can watch the closer view of a judge as it is near the commentary seats and it is good value because of 500 yen cheaper. C stand offers the closest view of Tsuiso and you can choose lower row where you can enjoy the dynamic drive or upper row you can see a whole view like B stand. Also it is not as good as SS seats but you can watch the closer view of a judge as it is near the commentary seats and it is 500 yen cheaper. Experience the technical performance sessions !! It offers a good value price tickets for reserved seat tickets as well as A stand. You enjoy watching the closest gap view right before your eyes where is very near the commentary seats. After this, you will see the technical performance just in front of you where you will have the most thrilling experience with the closet gap and extreme movement. Also, it is the turning point of audience wave, please be ready for that ! Standing noisily cheered area ! 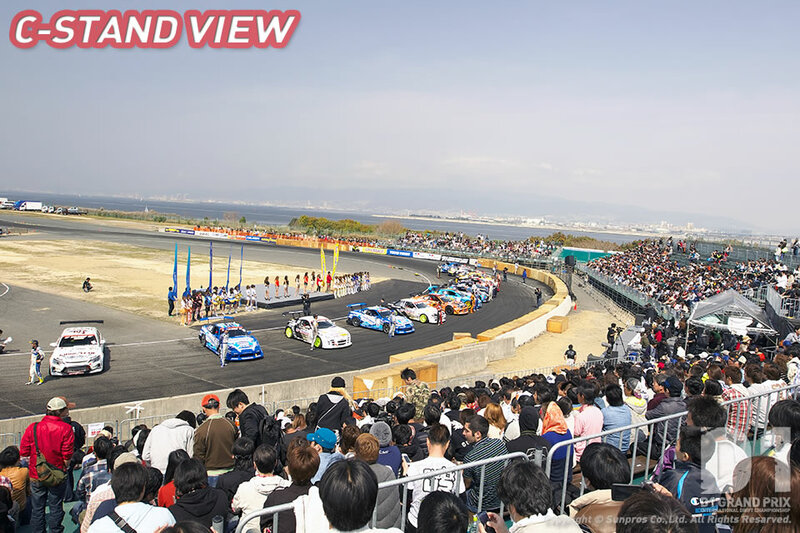 This is the at least expensive ticket seats for OSAKA DRIFT. You can watch in the standing area or public view area. It is good for the people who just want to drop by, visit to the booth area or only available in the morning. However, it is not good idea for those who want to see the complete race. As significant conjunction to be expected in this area, we highly appreciate for practicing good manners.